This is a beautifully written work that brings to life the world of Jacob ibn Habib and his contemporaries and explores the complex reception history of the En Yaaqov after its author's death. After his expulsion from Spain in 1492, Jacob ibn Habib created the En Yaaqov, a collection of Talmudic aggadah (non-legal material), by removing the majority of the Talmud’s legal portions but preserving the chapter order of the remaining material and adding his own introduction and running commentary. 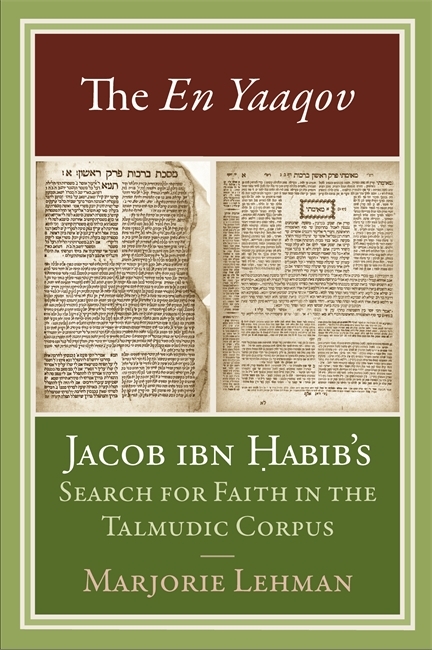 In The En Yaaqov: Jacob ibn Habib’s Search for Faith in the Talmudic Corpus author Marjorie Lehman argues that the En Yaaqov’s anthologizer, Jacob ibn Habib, purposely sought to create a Talmud "look-alike" in order to prove that Judaism’s foundational legal tract could also be seen as a theological document. By considering the factors that influenced ibn Habib, Lehman argues that his En Yaaqov was a reaction to the way that the Talmud was perceived and studied during the late medieval period among Spanish Jewry. In four chapters, Lehman explores the first printed edition of the En Yaaqov, delving into the intellectual culture and theological intricacies surrounding its creation and elaborating on the contributions of the En Yaaqov to the development of faith. Chapter 1 considers the political turmoil and challenges of resettlement that ibn Habib encountered after expulsion and that prompted him to produce the En Yaaqov. Chapter 2 focuses on the intellectual framework within which ibn Habib’s attitude toward Talmudic aggadah developed and explains why few running commentaries on the aggadot of the Talmud existed prior to his work. Chapter 3 discusses ibn Habib’s editorial decisions in choosing to construct the En Yaaqov as a Talmud "look-alike." In Chapter 4, Lehman analyzes key passages in ibn Habib’s commentary to the En Yaaqov to examine how he integrated text and context to provide a resource that Jews could utilize for spiritual growth and continuity of faith. In her conclusion, Lehman addresses the evolving printing history of the collection, which was quite different from that of the Talmud. Lehman argues that ibn Habib’s experiences as a Spanish Jew who was forced to flee Spain prompted him to make decisions not only about how the Talmud should be studied in the name of spiritual restoration but also about how Jews could survive future expulsions by cultivating a sustainable faithful relationship with God. This insightfully researched book will be informative to scholars of Talmud and Rabbinic Literature, late-medieval intellectual history and culture, Sephardic history, and the history of the Jewish book as well as to readers interested in the still-popular En Yaaqov. Marjorie Lehman is a distinguished professor of Talmud and Rabbinics at the Jewish Theological Seminary in New York City. She is the author of numerous articles integrating her expertise in the field of Talmud with gender studies, medieval studies, ritual studies, and education. This is a beautifully written work that brings to life the world of Jacob ibn Habib and his contemporaries and explores the complex reception history of the En Yaaqov after its author's death. It's a must-read for anyone interested in the En Yaaqov, its author, and the history of aggadah." Marjorie Lehman's The En Yaaqov: Jacob ibn Habib's Search for Faith in the Talmudic Corpus is a major work of intellectual history that will stand as a model of close textual scholarship, Jewish history, and the subtle play of the history of ideas." A hugely important study of a crucial and much-neglected chapter in the history of rabbinic literature. Lehman's long-awaited study of the En Yaaqov, one of the great commentary works in the reception history of the Talmud, presents an indispensable contribution to the history of the Hebrew book. It provides a prehistory to the contemporary study of rabbinic aggadah, by compellingly embedding the En Yaaqov in the complex tapestry of the Jewish intellectual world of the post-1492 expulsion from Spain. Throughout, Lehman remains finely attuned to the significance of the En Yaaqov to the history of Jewish education. A beautiful book!" Marjorie Lehmans well-written book sheds important light on ibn Habibs accomplishment and its ramifications for Judaisms future. The En Yaaqov is significant for studies of early modern Jewish rabbinic culture, especially in the Ottoman Empire, and for the history of the Jewish book.